Ohio state Sen. Bill Seitz, an ALEC board member, wants to kill his state's renewable energy standard. He says it reminds him of "Joseph Stalin's five-year plan." After being accused of "literally lying" about climate change by one of its own high-profile business members, excoriated for being a "corporate bill mill," and losing nearly 100 company sponsors, you might expect the rabidly anti-environmental American Legislative Exchange Council (ALEC) to tone it down a little. Emboldened by the November elections, which resulted in Republicans now controlling 31 governorships and more than two-thirds of state legislative chambers, the secretive corporate lobby group seems even more committed to its wrecking-ball agenda. At the group's most recent conference, held earlier this month in Washington, D.C., more than 400 predominantly Republican state lawmakers and industry reps formulated sample legislation that will serve as templates for statehouses across the country. During the three-day event, they put the finishing touches on bills and resolutions that would, among other things, weaken the Endangered Species Act, thwart implementation of the Environmental Protection Agency's proposed standard for existing power plant carbon emissions, and block the EPA's new proposed standard for ground-level ozone. If that weren't enough, they also considered a resolution urging Congress to abolish the EPA as we know it. Corporate lobbyists reportedly shot down the idea as too extreme even for ALEC, but the group can still do plenty to stymie government efforts to protect public health and the environment. Per usual, ALEC's dog and pony show also included one-sided policy tutorials by industry mouthpieces. In one closed-door session, according to the Washington Post, an American Fuel and Petrochemical Manufacturers Association official told ALEC lawmakers that the EPA's new ozone standard would harm states' economies and do little to protect residents' health. Never mind the fact that ground-level ozone -- the most pervasive pollutant nationwide -- is linked to asthma, heart disease and premature death, and the EPA estimates the proposed standard's public health benefits would be two to three times greater than the cost to industry. Another session featured Jack Hubbard, vice president of the consulting firm Berman and Company, pitching his firm's campaign to undermine the credibility of leading environmental groups and celebrity activists. Called "Big Green Radicals," the campaign is similar to Berman and Company's attacks on labor unions, animal rights organizations and public health advocates on behalf of its anonymous corporate clients. 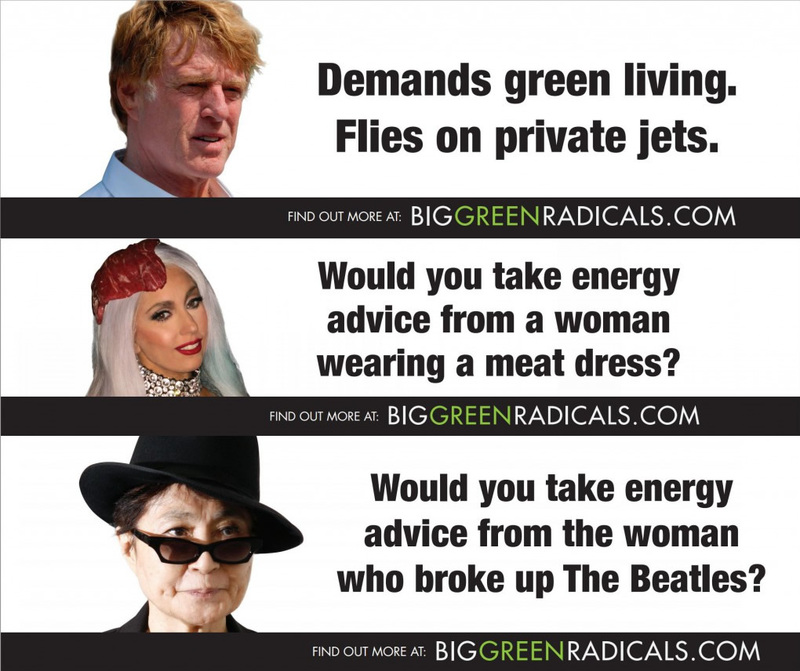 This time around, the firm is targeting Food and Water Watch, Greenpeace, the Natural Resources Defense Council and the Sierra Club, and earlier this year it placed billboard ads along the Pennsylvania Turnpike ridiculing Lady Gaga, Yoko Ono and Robert Redford for opposing hydraulic fracturing. Finally, an ALEC conference wouldn't be complete without a climate science denier or two. At the organization's annual conference last July, Joe Bast, president of the fossil fuel industry-funded Heartland Institute, argued that the benefits of carbon emissions far outweigh their costs, while the Committee for a Constructive Tomorrow denied that carbon dioxide is a primary cause of global warming in the first place. The D.C. conference showcased two speakers who made similarly indefensible claims. Craig Idso, chairman of the Center for the Study of Carbon Dioxide and Climate Change, and Richard Bezdek, president of the research firm Management Information Services, were the featured speakers at a session titled "The Greening of Planet Earth." Idso, a Heartland Institute grantee and former environmental science director at Peabody Energy, the world's largest private sector coal company, told the gathering, according to Al Jazeera: "We are rapidly approaching a dangerous precipice -- a precipice defined by an insatiable desire by far too many policymakers to regulate the use of fossil fuels. Atmospheric carbon dioxide is not a pollutant." Bezdek, meanwhile, likened climate science advocates to Nazis. "Virtually everything that climate activists say is demonstrably false, whether it's wildfires, whether it's ocean climate, or whether it's hurricanes. ... That's why it's frustrating," said Bezdek, who claims the benefits of carbon dioxide exceed its costs by a 50 to 1 ratio. "It's the old Nazi theory, that if you repeat a big lie loud enough and long enough, people believe it. That's unfortunately what's happened. It's very difficult to counter with a silly thing like facts." Psychologists would call that "projection." ALEC boasts that its 1,800 legislator members introduce nearly 1,000 ALEC-inspired bills annually and that 20 percent of them, on average, become law. A 2013 report by the Center for Media and Democracy (CMD) indicates that ALEC's numbers are pretty much on the mark. The CMD study identified 466 ALEC bills introduced in the 2013 legislative session across the country on topics ranging from voter identification and "stand your ground" rights to energy and the environment. Eighty-four of the 466 bills passed and became law -- an 18-percent success rate. That's a stunning accomplishment, considering that the U.S. Congress passed less than 2 percent of the bills introduced in 2012. Molly Jackman, a political scientist at Vanderbilt University, agrees that the group's track record is impressive. "The American Legislative Exchange Council wields considerable influence in state legislatures," Jackman concluded in her 2013 analysis of 132 ALEC-sponsored bills she conducted as a fellow at the Brookings Institution. "The bills that it writes find their way into the majority of state legislatures. Moreover, the percentage of those bills that pass is strikingly high compared to the dismal rate at which all other bills are enacted into law." So why does ALEC have such a good track record? State lawmakers have limited time, limited salaries and, perhaps most important, limited resources. "States are prime targets for corporations because it's easier to get things out of state legislatures than Congress," explained political scientist Darrell West, the Brookings Institution's director of governance studies. "The biggest problem is state legislators are understaffed." Stella Rouse, a political scientist at the University of Maryland, seconded that assessment. "The legislative staff issue is huge," she said. "They are vital. Legislators want to introduce bills, but when they don't have a staff or it is very limited, ALEC provides them with a shortcut by providing a ready-made bill. ALEC provides the expertise that legislatures lack." The fact that most state legislatures are part-time and consequently don't pay full-time salaries also strengthens the hand of groups like ALEC, added West, the author of Billionaires: Reflections on the Upper Crust, which analyzes the growing political activism of the uber rich. "Many legislators have to have jobs on the side, so they don't have a lot of time to put into legislating. That makes them dependent on outside sources." The numbers tell the story. Only 10 states have what could be considered a full-time, or nearly full-time, legislature: California, Florida, Illinois, Massachusetts, Michigan, New Jersey, New York, Ohio, Pennsylvania and Wisconsin. Lawmakers in those states work at least 80 percent of a full-time job on legislative work, which includes time in session, constituent services, committee work and electioneering. They currently make an average of $81,000 a year and, based on 2009 data, average nine staff members each, according to the National Conference of State Legislatures, a nonpartisan, professional-development organization that does not accept corporate money or produce sample legislation. Lawmakers in another 24 states devote about 70 percent of a full-time job to legislative duties. On average, they make $43,000 annually and average three staff members each. Lawmakers in the remaining 16 states, meanwhile, work only 54 percent of a full-time job and make an average of only $19,000. They average one staff member each, and a number of legislators have no personal staff at all. That's a void ALEC is only too eager to fill. ALEC corporate sector members do much more than feed lawmakers sample legislation and break bread with them at ALEC conferences. Most of ALEC's funding comes from the more than 200 corporations, trade groups, corporate law firms and industry-funded think tanks that pay annual dues of $7,000 to $25,000, plus $25,000 to $40,000 to sponsor an ALEC conference session. And many of those corporations and trade groups ply ALEC lawmakers with generous campaign contributions. An analysis of the campaign contributions ALEC energy sector members made to the organization's board of directors, for example, found that all but one of the 21 board members received funding over the last decade from at least one ALEC energy company, utility or trade association. In most cases, they received multiple donations, which collectively amounted to more than $290,000. Top ALEC energy sector contributors included BP North America, which donated to eight board members; Conoco Phillips, Duke Energy, ExxonMobil and Koch Industries, which each funded seven board members; American Electric Power, which backed six; and Chevron, which financed five. All that support builds loyalty. 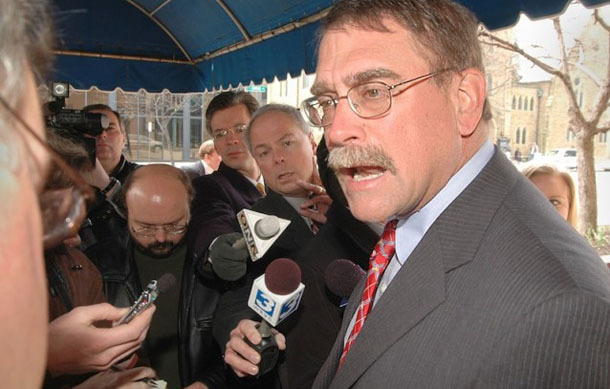 Ohio state Sen. Bill Seitz, an ALEC board member, is a case in point. A Republican lawyer from Cincinnati, Seitz received more than $70,000 from coal, oil and gas, and utility companies in the 2008 and 2012 election cycles. Half of that money came from two Ohio-based utilities that rely heavily on coal: American Electric Power, an ALEC member headquartered in Columbus, gave him $21,500, and the Akron-based FirstEnergy contributed $15,000. Ashland Oil, BP North America, Dominion, Duke Energy, Marathon Oil and Spectra Energy -- all ALEC members -- also donated to his campaigns. Chairman of the Senate Public Utilities Committee, Seitz has been leading the effort to gut Ohio's energy efficiency and renewable energy standards, which, compared to those in other states, are relatively modest. The Ohio efficiency standard set a target of reducing energy use by 22.5 percent by 2025, while the renewable standard requires Ohio utilities to generate 12.5 percent of their electricity from renewable energy sources by the same year. Modest or not, the standards have already delivered benefits. For example, according to Ohio Advanced Energy Economy, a trade group, in just four years the energy efficiency standard saved Ohio consumers more than $1 billion. Meanwhile, filings by Ohio utilities, including American Electric Power, Duke Energy and FirstEnergy, show that the standard has saved consumers two dollars for every dollar invested. Regardless, ALEC has set its sights squarely on killing these standards across the country. In this case, Seitz failed to get ALEC-sponsored bills passed that would have repealed the standards, but he was able to push through a bill last summer that stopped the mandated annual increases in their targets for two years to allow a committee to study their impact. Ohio Gov. John Kasich, a former ALEC member who received more than $200,000 in campaign contributions from utility, coal, and oil and gas companies over the last two election cycles, signed the bill into law in June. A day before ALEC convened its Washington, D.C., conference, more than 100 national, state and grassroots organizations issued a joint letter urging ALEC state lawmakers to reject the group's anti-environmental agenda, cancel their memberships, and encourage their colleagues to do so as well. Signatories included African American Ministers in Action, Environment America, Healthcare Without Harm, Interfaith Power and Light, the League of Conservation Voters, the Natural Resources Defense Council, and the Union of Concerned Scientists. "ALEC is pushing to weaken or repeal state renewable energy and efficiency standards, to reduce financial incentives to adopt rooftop solar, and to undermine EPA's efforts to limit carbon pollution from power plants," the letter stated. "ALEC does not support any policies that would move toward solving the climate crisis." Meanwhile, a week after the ALEC conference, more than 200 state lawmakers, consultants, donors and public interest advocates gathered in the nation's capital to mount their own challenge. It was the first national meeting of the newly minted State Innovation Exchange (SIX), whose mission is to support progressive state lawmakers by providing training and technical support, as well as sample bills to protect voting rights, raise the minimum wage, and strengthen public health and environmental safeguards. The group hopes to raise $3 million to $5 million for SIX's first year and eventually establish a $10-million annual budget funded by individual donors, unions, foundations and corporations. "Progressives are looking around to figure out where to push back, and there has not been a vehicle to do that at the state level," SIX Executive Director Nick Rathod, the White House liaison to the states during President Obama's first term, told Politico. "It's the biggest missing piece in the progressive infrastructure." SIX has a formidable task ahead, but Rathod is banking on what it lacks in funding and experience will be made up by what he sees as a distinct advantage. As Rathod puts it, SIX -- unlike ALEC -- is promoting a "people's agenda," not a corporate one. "It's stupid to create an organization that is mimicking something else," Rathod said during the SIX conference's opening session. "We're going to be better than that. We're different from them because we're going to be transparent. We won't go behind closed doors and vote with corporate America."